Back in September I placed an order with People Tree for a couple of dresses. Unfortunately one of them wasn't quite right and the other a little too tight so I exchanged it for a bigger size. I received the next size up a week later and love it! I have to wear "big knickers" with it as it's a bodycon dress and I've been eating quite a few naughty treats lately but I absolutely love the dress. 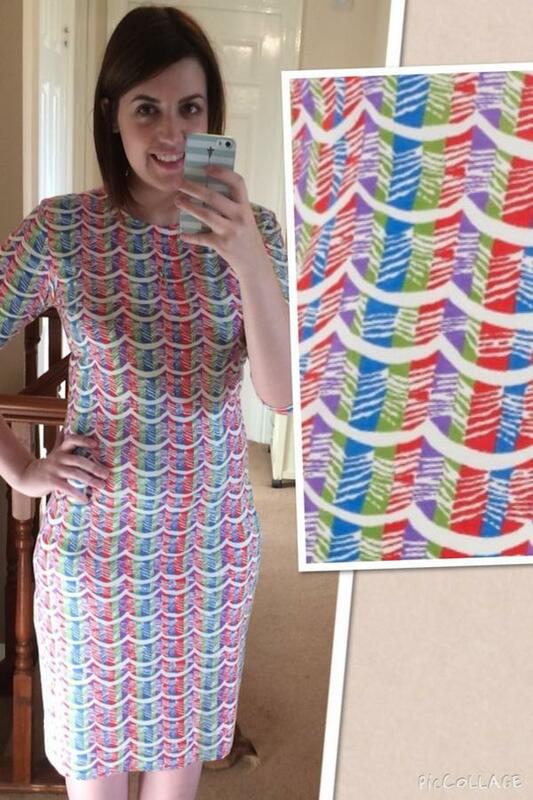 The Wave Bodycon Dress is designed by Zandra Rhodes and has the most gorgeous, bright print in red, purple, blue & green with white zig zags. Use my exclusive code "AMBER10" for 10% off your People Tree order. *This post is not sponsored. I am an Ambassador for People Tree. I make a small % of the revenue I generate for People Tree. This does not affect my opinion & I will always be honest when talking about their clothing & company. It's a lovely pattern! I can't wear bodycon dresses because even big knickers can't help me. Woe.